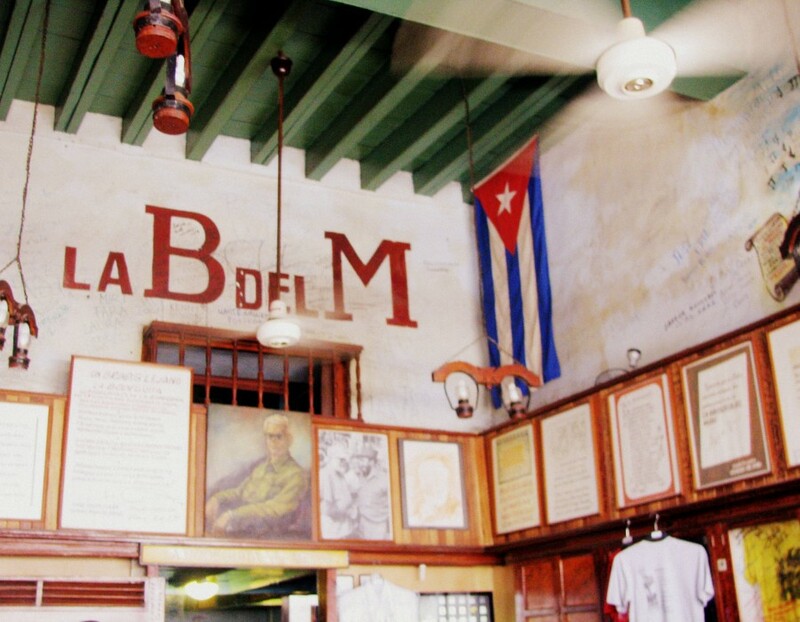 Here it is La Bodeguita del Medio, a place that reveals pure cubanness from the 1950s! Many are there interesting sites, but this one is undoubtedly a must-see for all the tourists that visit the charismatic capital of the island. Let’s go in depth into its history, origin and legend. What is the famous La Bodeguita del Medio? Today it’s a restaurant where you can find a typical Creole menu: white rice and black beans, cassava (yuca) with mojo (dressing or sauce that is usually prepared with garlic and sour orange) and tostones (fried banana), among other dishes. All accompanied by typical Cuban cocktails, with always present mojitos and tobaccos. The place is relatively small and if you do not book your seat in advance you can run the risk of not finding any place left since it is always crowded. It is certainly a unique place, but prices are usually inaccessible for an ordinary Cuban. Today, it is basically a venue where tourists can listen to the live music and explore traditions of the most genuine Cuban culture. Historically, it was visited by personalities of politics and culture from all over the world. But has it always been as we know it today? Of course not, in 1942 it was nothing more than a food warehouse where the owner Angel Martínez used to sell some beverages and salty snacks to accompany. Initially it was called La Bodeguita de Martínez, but then it was baptized by those who visited it as La Bodeguita del Medio because of its location on the street Empedrado, very close to the Cathedral Square. The place begins to be massively visited by intellectuals who were coming there right after making arrangements in the publishing or printing house of Feliz Ayón, who was a neighbor of Martínez. Only by the demand of those who visited la Bodeguita is that they began to sell various dishes, first only to a group of friends, but soon the number of diners started to increase. In 1948, the establishment acquired some characteristics of the current “Bodeguita del Medio” and only a year later, Silvia Torres, “la china”, who would make her cooking art a success. It is on April 26th in 1950 when the place was officially inaugurated under the name “La Bodeguita del Medio”. Why does it have such a peculiar decoration? Who has visited it? According to popular belief, the initiative was of the journalist Leandro García, who put his signature on the wall the day of one of the social gatherings. 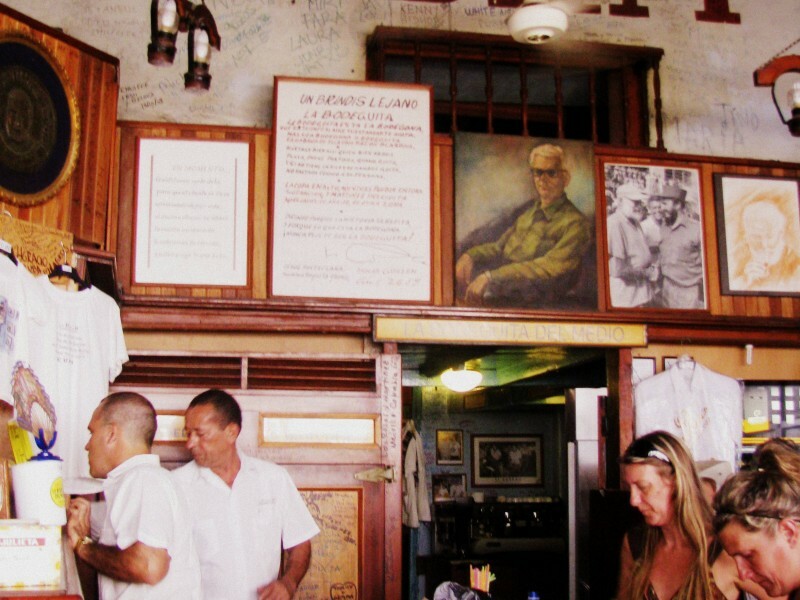 Since then la Bodeguita upholds a tradition that the personalities who visit the place leave a mark, a record or take pictures that later become part of the history and decoration of the place, although the most common thing is to leave a simple graffiti. Among the visitors of this emblematic venue are: Pablo Neruda, Errol Flynn, Agustín Lara, Brigitte Bardot, Ignacio Villa (Bola de Nieve), Gabriela Mistral, Carlos Mastronardi, Nicolás Guillén (poeta nacional de Cuba), Salvador Allende (past president of Chile) y Ernest Hemingway (famous American writer who resided on the island for several years), among others. In 1959, the premises were closed down, its walls were painted and original signatures were lost. Some of the photographs of distinguished visitors also went missing. Thanks to Salvador Allende who reopened the premises and managed to recover some photos, which were partly donated, finally it was possible to recreate the atmosphere of its time and to rewrite some of the lost signatures. According to Ecurred, nowadays there are establishments with the same name in other places of the world such as Argentina, Bolivia, Mexico, Colombia, Venezuela, Germany, England or Gijón. However, the official website of the iconic restaurant on the island says there are only seven franchises. They are located in: (1) Mexico City, (2) Puerto Vallarta, (3) Guadalajara, (4) Playa del Carmen in Quintana Roo, (5) San Jose, Costa Rica, (6) Villahermosa in Tabasco, (7) León in Guanajuato. The magic of the place is nowhere to be found. It is a must-see, even if possibly you will not be able to have a dinner there finding all the seats occupied. But still it’s worth dropping in even just to take a picture, listen to the traditional music of Carlos Puebla or to drink a delicious mojito. It is a place you will feel tempted to enter if you arrive in Old Havana. “My mojito in La Bodeguita, My daiquiri in El Floridita”.